Brian Terrill's 100 Film Favorites - #20: "The Court Jester"
We’re down to the Top 20! 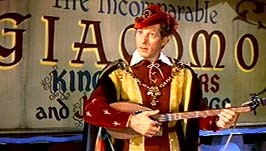 That said, I truly believe The Court Jester is one of the best comedy films ever made. 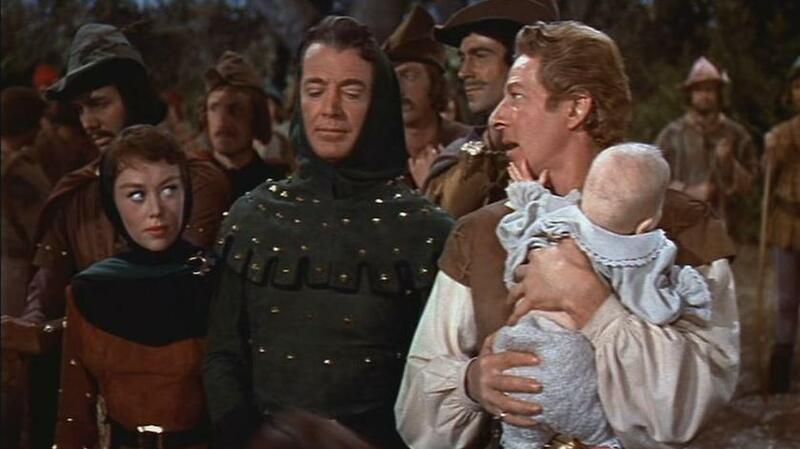 Set in medieval England, it stars Danny Kaye as Hubert Hawkins, a carnival performer hired by the Robin Hood-esque vigilante the Black Fox to entertain his men. The Black Fox and his band dedicate themselves to protecting an infant who is the true heir to the throne, as evidenced by the “Purple Pimpernel,” a flower-shaped birthmark on the baby’s royal rump. The rebels’ ultimate goal is to overthrow the usurper currently on the throne and restore the child as king. 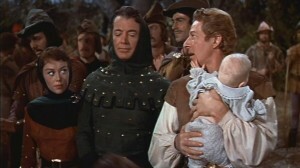 Jean, the Black Fox, Hawkins, and the infant King. Hawkins desires a more active role in the rebellion than singing, dancing, and occasionally flashing the baby’s purple posterior at potential recruits. He gets his wish when he is assigned to accompany Maid Jean, the Fox’s comely lieutenant, on a mission to transport the baby covertly across the countryside. While stopping in an old mill for the night, they encounter The Incomparable Giacomo, a renowned Italian entertainer who has just been hired as the new jester to the pretender king. Realizing that a jester would have intimate access to the king, Jean clonks Giacomo over the head and instructs Hawkins to take the jester’s place. As “Giacomo,” Hawkins must travel to the castle, meet the rebels’ contact within the walls, and locate a key which will unlock a secret passage and allow the Black Fox and his men to storm the place. Hawkins wears this same confused expression for most of the movie. What really makes the film a masterpiece is that each of the many characters have very clearly-defined goals they are pursuing. Through the wonders of dramatic irony, we as viewers are aware of the many interweaving misunderstandings which arise from the characters’ conflicting goals. From the moment Hawkins’ “Giacomo” walks in the door, these misunderstandings begin piling up. The man he pegs as his contact is in fact the king’s most trusted adviser, Ravenhurst (Basil Rathbone, better known for starring in a string of Sherlock Holmes films). Ravenhurst is in fact a clandestine collaborator with the REAL Giacomo, a skilled assassin whom he has invited to the castle to assassinate his fellow advisers. The usurper king hopes to marry his daughter to Sir Griswold, a powerful knight from an adjacent kingdom, to strengthen his fighting force against the Fox. His advisers are all for the union, save for Ravenhurst, who fears losing his privileged position as the king’s right-hand man. 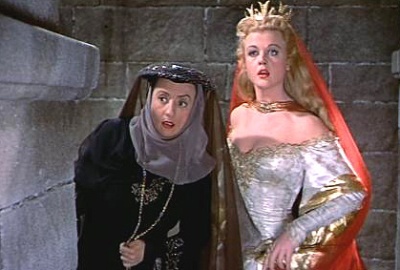 The princess (a young Angela Lansbury) is against the plan as well. She swears she will only marry for love, and awaits the arrival of a dashing stranger who will sweep her off her feet (her head has been “filled with fairy stories” by her servant, the witch Griselda). As it becomes more likely that she will be forced into marriage with Griswold, the princess threatens to have Griselda executed if her promised “hero” does not arrive. Mrs. Potts? More like Mrs. Hotts. The witch therefore sets about shaping Hawkins / Giacomo into the ideal fairytale romantic. She hypnotizes him, transforming the normally bumbling entertainer into a debonair adventurer, supernaturally skilled in swordplay. This alternate persona can be triggered simply: Griselda need only snap her fingers. The problem is that he can also be “snapped out,” returning to his oblivious, clumsy self with every other finger-snap. Additionally, whenever he’s “snapped out,” Hawkins forgets all that transpired while he was hypnotized. So Jean expects Hawkins to aid the rebels, Ravenhurst expects him to kill the advisers, the princess expects him to be a legendary lover, and the witch expects him to at least play the part to save her skin. None of these characters are aware of the others’ demands on the jester, and Hawkins himself “snaps” in and out of awareness of the various schemes every few minutes (there’s an awful lot of finger-snapping going on at this castle). An extra level of complication is added when Sir Griswold arrives at the castle. Furious to find the princess infatuated with the jester, a “commoner,” Griswold announces that if Hawkins were a knight, he would gladly slay him in mortal combat. 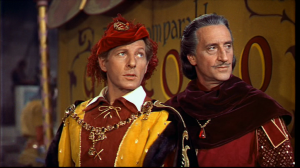 The king is intrigued: Eager to see his daughter wed Griswold, he orders Hawkins/Giacomo to be rushed through the trials and rituals of becoming a knight, so that Hawkins can lawfully challenge (and be killed by) Griswold, who would then win the princess’ hand in marriage. Hawkins’ meteoric rise to knighthood is one of the funniest sequences in the film. As Hawkins meekly protests, the various “tests of knighthood” virtually complete themselves around him (He must “shoot a hawk from flight,” and the bird falls dead before he can nock an arrow; he must “scale a stone wall in armor,” and his pages practically hurl him over the wall). At last, Hawkins is rushed through the initiation ceremony and officially becomes a knight. Things get still more complicated when the chalice from the palace breaks, only to be replaced by “the flagon with the dragon.” Meanwhile, one of Griswold’s aides clues him in to the situation. Now, both Hawkins and Griswold are pacing the arena, hopelessly attempting to memorize the tongue-twister and only growing more confused. Through a twist of fate, Hawkins actually bests Griswold in combat (in one of the sillier sequences, lightning strikes Hawkins’ armor, magnetizing it and causing Griswold to lose his mace when it sticks to Hawkins). By this point, Jean (who has entered the castle herself, having been brought in as a “wench” to serve as eye-candy at the tournament) has located the key on her own, and unlocks the secret passage. Unfortunately, the passage has collapsed, leaving an opening too small for any normal-sized man. Ravenhurst, meanwhile, has deduced that the jester is not who he claims to be, but incorrectly assumes that Hawkins is the Black Fox himself. Wanting to stay in the king’s good graces, Ravenhurst reveals the jester’s “secret identity” – just as a squadron of midget acrobats (Hawkins’ associates from his days at the carnival) storm the castle and begin battling the king’s soldiers. Soon, the Fox’s normal-sized troops arrive as well. Hawkins assumes his “swashbuckler” persona once more to duel Ravenhurst, whom the midgets ultimately fling from the parapets via catapult. Phew. That was complicated. Keep in mind that when I first saw this movie I was around five years old. I don’t think I fully understood the many-layered plot of this film until I’d watched it 4 or 5 times, and I’m still not sure I’ve conveyed the story properly. 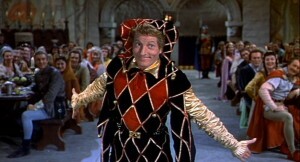 The Court Jester remains a masterwork of classic humor. The surprisingly intricate story, with a bumbling protagonist caught amidst many layers of courtly intrigue, creates comedy through complexity, and the misunderstandings that arise when characters’ goals are at cross-purposes. Give it a watch or five, and try to remember: The pezzel with the poisley’s in the fizzle with the chazzle. -That’s Glynis Johns as Maid Jean. Johns would later portray Mrs. Banks, the children’s mother in Mary Poppins. How I never noticed that before is beyond me. -The “pellet with the poison” bit is one of the most iconic and funniest sequences in the film. Thus, I was dismayed to find in my research that the gag was completely ripped off of an earlier film, 1939’s Never Say Die, starring Bob Hope. 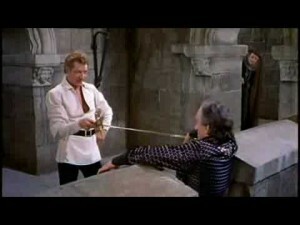 The pacing and editing of the two sequences are nearly identical, and the setup is the same as well: Both feature characters attempting to survive an impending duel. It’s therefore hard to read The Court Jester‘s use of the gag as anything but plagiarism…but both scenes are still funny. Danny Kaye was absolutely not an imitator of Jerry Lewis, and anyone who’d suggest he was doesn’t have much of a grasp of entertainment history. 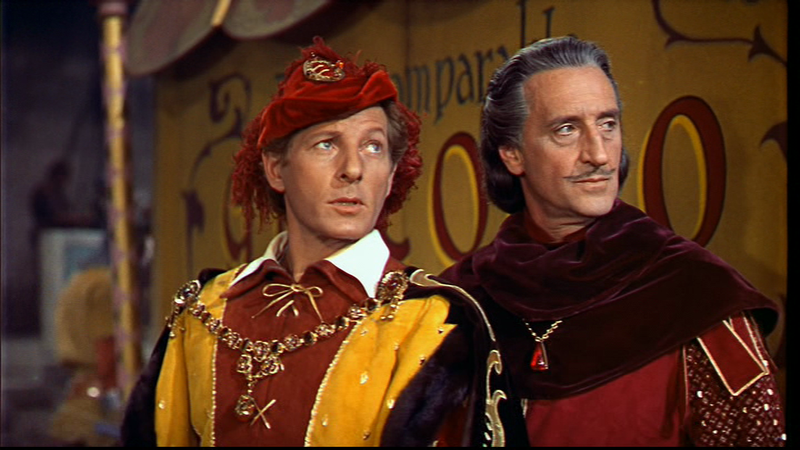 Danny Kaye was about 15 years older than Jerry Lewis. He created and perfected his pratfall-taking, fast-moving and fast-talking, tongue-twister persona on the vaudeville circuit in the ’30s while Lewis was performing as a child act with his parents in the Catskills. Both children of Jewish immigrants, both dropped out of high school, both very talented.